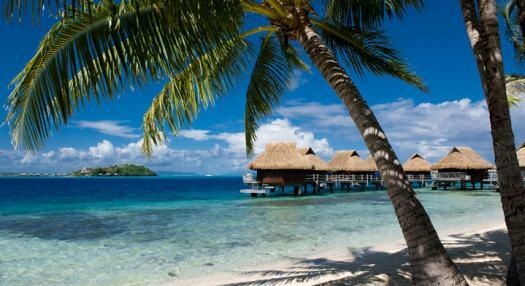 French Polynesia counts a few islands in the middle of the Ocean... or should we say an ocean of islands? This is a thousand years old story which started with the “Grand Voyage” (the migrations) and encounter of the first Polynesians with the Big Ocean “Moana”. • advance scouting: a fast double canoe would go first to scout out the lands following the path drawn by the stars. • construction: very large canoes were built by specialists to transport everyone after the scouts’ return. These canoes were the ancestors of nowadays catamarans. • The journey: the next step was the journey itself following the ocean currents, the wind and the stars. This is how the Mā’ohi conquered the islands of the large Polynesian triangle formed by Hawaii (North point), Rapa Nui (Pasqua Island East point), Aotearoa (New Zealand South point). With its new fleet Air Tahiti Nui wants to honor the islands of our beautiful destination, their exceptional environment and beauty and the first explorers. 4 aircrafts, 4 names: 3 iconic places and one exceptional explorer. This is a tribute to the past and to today’s living dream, the window to a promising future. 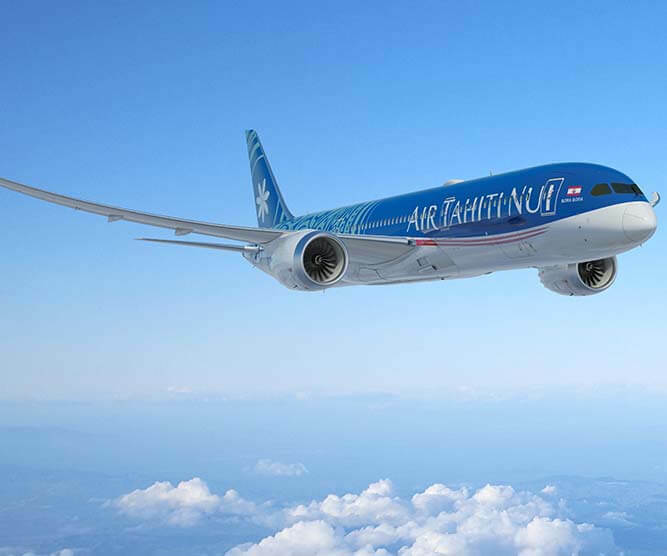 The first aircraft of the new Air Tahiti Nui fleet is named after one of the 77 atolls of French Polynesia: Fakarava. It carries with it the promise of a sustainable environment, perfect balance between nature and mankind. The South Pacific is home to the largest oceanic natural reserves, from marine protected areas to Biosphere Reserves (UNESCO), and it has been the case with Fakarava since 1977 (an area comprising the six other atolls of its municipality : Aratika, Kauehi, Niau , Raraka, Taiaro and Toau), which has been confirmed and extended in 2006. These thin strips of land “ of which dreams are made off” as Robert Louis Stevenson wrote, are a rare and fragile ecosystem. To enter the lagoon of Fakarava, the second largest of French Polynesia after Rangiroa, we take Garuae, the largest pass in Polynesia (1600 m wide), exploding with life and one of the most reknown scuba diving sites… One of the last places in the world where groupers can spawn. These atolls are covered with primary forests of puatea (Pisonia grandis), coconut groves and other shrubs characteristic of atolls, mikimiki, tohinu, tefano and pandanus, exposing their brightgreen leaves and overall bright green colors. The fauna and flora are remarkable, with rare, protected and endemic species, such as the kingfisher or koteuteu of Niau. Land here is nothing without the sea. It remains an expectation, a hope and the Polynesians perceive better than anyone else the fragility of this unique environment. They are the gardians of its future. It does not take less to save the 176 varieties of coral or the 2014 species of fish, including humpback whales, emperor angelfish, sacred turtles... Through them, it is the whole legacy inherited from their ancestors that Polynesians will transmit to future generations. Tupaia or Tupai'a was born around 1725, on the sacred island of Ra'iatea. This son of ari'i (chief ) had received the full and sacred education of young aristocrats destined to Priesthood or commandment. He was introduced to navigation, orientation technics, knowledge of the seasons, currents, observation of the sky and stars. In his thirties, he battles for his king and is badly wounded in 1757. Probably in exile before 1760, he became one of Queen Purea's advisors, of the royal line of the Teva, who received Wallis when he reached Tahiti in 1767. During the three-month stay of the Endeavor commanded by Captain James Cook in 1769, Tupai’a became friend with naturalist Joseph Banks. It was at his insistence that Cook agreed to take Tupai’a aboard, while continuing exploration of the South Pacific. The English officers then discovered a man of exceptional culture. "He knows more about the geography of the islands in these seas, about the production, the religious laws, and the customs of their people, than anyone else we've met", wrote James Cook, visibly impressed. Tupai'a wrote for him a detailed map of the South Pacific, allowing the English to claim the discovery of several islands still unknown to the Europeans. Totally amazed by Banks' drawings, he was the first Polynesian to learn writing and painting. Tupai’a died of scurvy, probably during the month of November 1770. His knowledge was such that his memory remained intact. A few months before his death, while the Endeavor was arriving in Aotearoa, now New Zealand, Tupai'a served as an interpreter between the Maori and the British. Because he was a tahu'a, born on the sacred island of Ra'iatea, he was able to remind the Maori of their origin, their language and their common ancestors which was an essential diplomatic aid. Air Tahiti Nui, by naming its second aircraft "Tupaia", is honoring the ancestral Polynesian knowledge of travelling overseas. Like Tupai’a use to, Air Tahiti Nui takes the ways of the stars to tighten bonds between people. 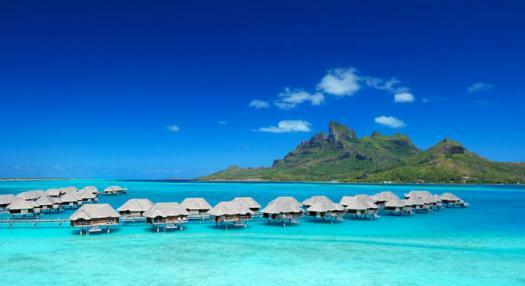 Bora Bora has always inspired people. You just have to pronounce her name to see eyes glow. She has been named “the Pearl of the Pacific” for half a century. She represents the myth of Heaven on Earth. What if it was not a myth? We can go once or a hundred times to Bora Bora, we always feel the same emotion. The island gives rise to a rare delight. Formerly in Raromatai (Leeward Islands) it was bearing the name Mai te Pora, “ Created by the gods ”. Guarded by mount Otemanu, the barrier reef, punctuated of motu (islets) surrounds a vast lagoon. And what a lagoon! Words are lacking to describe these hues of blues and multiple greens which follows one another: translucent jade, azure, fine cut emeralds, iridescents greens and multicolored blues. That can't be named. They change by the hour, with the clouds and skys, or with the reflection of the tropical light and blissfull trade winds. In Vaitape, the main village of the island, go search for treasures and find your own special Black Pearl. Each has a unique perfection and amazing colours, just as our islands and lagoons. But there is one that canot be bought. Maybe because it remains forever engraved in our heart, like a dream standing above all others: this unique lagoon of Bora Bora. Staring at the horizon, the dream prevails, hearts conquired by so much beauty. “Seeing an island is seeing them all” once said a sailor with his sailor's eyes. Nothing is more wrong. Tetiaroa will be the proof of it. It will be for you the promise of an unreal embrace with the world. The promise of an island. 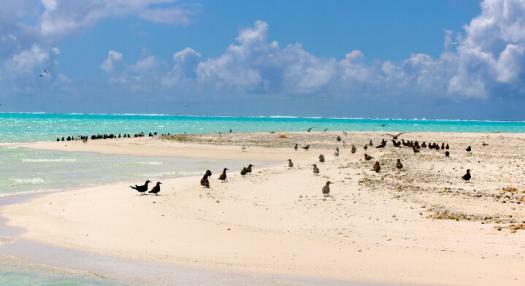 We feel a strong attraction for Tetiaroa, whether we get there by sailboat or by air. From afar, the vast coconut groves are pricked by green palms that look like the sharp spears of threatening warriors. When approaching, they are in fact only sleepy shadows dancing to the rhythm of a disinterested breeze. 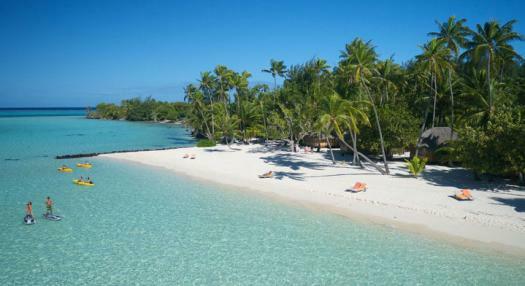 Tetiaroa is the only atoll of the Society archipelago, lying on the water 50 km north of Tahiti. Like its 77 cousins in the Tuamotu, it seems suspended between sky and sea. There stop the similarities. Some atolls have the richness of ancient soil, on which anything would grow. They are favored by a large population who have taken up their quarters on their banks. Others are empty, poor, and seem to wander aimlessly, like ghost ships. Tetiaroa, like a preserved garden of Eden, was for a long time the secondary residence of the ari'i of Tahiti, where their young teenagers would rest and shape up. Marlon Brando fell in love with the place during the filming of “Mutinies on the Bounty”, to the point of not wanting to leave it. In those dreamy moments where the mind wonders over the shimmers of the lagoon, under a sky full of sea birds flying free in a protected paradise, Marlon gave to the world a treasure of alchemy: perfect balance between a man's will and nature. Principles of a harmony that took, some years later, the name of sustainable development. It is in this spirit that the opening of the luxury boutique hotel The Brando, operated with complete energy independency, was built in 2014. By naming its fourth aircraft Tetiaroa, Air Tahiti Nui highlights its comitment for sustainable tourism, which respects the land, the fauna, the flora and men. Because it is the future of Polynesia and the destiny of the world.